Les is a crew member with UK and Ireland Master Spinning® Instructors, giving presentations and supporting at fitness showcases and events around the country. In 2005 whilst in the role of Contract Fitness manager, Les brought the Spinning® programme to Bristol City Council leisure centres, opening up a whole new exercise experience to thousands of individuals. Since then Les has been mentor to many instructors and budding enthusiasts, providing inspirational training sessions. Les has been teaching exercise and fitness for 24 years, and is widely respected for his knowledge and expertise. Les is also a tutor/assessor delivering level 2 and 3. Since retiring from his athletics career in mid 90s Les now enjoys playing badminton and going for bike rides. When Les is on the bike, the emphasis is always on a fun, fitness experience. 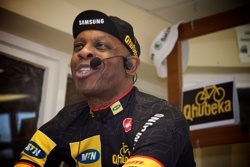 Join Les for his award winning, Spinning® rides!